The art of violin playing was about to be revolutionized when Maud Powell stepped into the Victor recording studio for the first time in 1904. The unparalleled standard for violin performance that Powell engraved on the spinning wax ushered in the modern age of violin playing and marked the historic marriage of recording technology to the highest achievement in violin playing. The Victor Company's choice of Maud Powell to be the first solo instrumentalist to record for its newly inaugurated celebrity artist series (Red Seal label) was no surprise. Maud Powell was internationally recognized as America's greatest violinist who easily ranked among the supreme violinists of the time -- Joseph Joachim, Eugène Ysaÿe, and later, Fritz Kreisler. 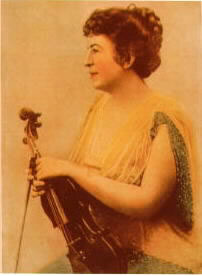 A popular favorite as well, she won the affection of the American public with her unabashed enthusiasm for the violin. In November 1904, Maud Powell was ushered into a small, acoustically "dead" room and strategically placed before a large funnel that appeared like the gaping mouth of a dragon. The nearer one could stand to this mechanical monster, the better the recording. The music's vibrations agitated a needle in an adjoining room that scratched impressions of sound waves on the soft, spinning wax from which a record could then be molded. "I am never as frightened as I am when I stand in front of that horn to play," Maud Powell once explained. There's a ghastly feeling that you're playing for all the world and an awful sense that what is done is done." Acoustic recording was a wholly mechanical process; electrical recording (with microphone) began in 1925, five years after Powell's death. Yet allied with the impeccable art of Maud Powell, the primitive technology revolutionized the way we hear music. At a time when music was heard live or not at all, the pioneering Powell welcomed the new technology, knowing that classical music would become popular as it became more familiar through repeated hearings. By January 8, 1917, Powell could give a recital in Carnegie Hall based solely on her recorded repertoire, dramatically demonstrating how her alliance with the talking machine had transformed musical taste. Maud Powell was born on August 22, 1867, in Peru, Illinois, on the western frontier in the American heartland. A pioneer by inheritance, she was endowed with the same extraordinary passion, integrity and vision that characterized her missionary grandparents and unconventional parents. Her grandparents had been Methodist missionaries in Ohio, Wisconsin, and Illinois before the Civil War. Her father William Bramwell Powell was an innovative educator; superintendent of the public schools in Peru, then Aurora, IL, and finally Washington, D.C. Her mother Minnie Bengelstraeter Paul Powell was a pianist and composer whose gender precluded a career. Minnie and Bramwell's sisters were active in the woman's suffrage movement. Maud's uncle John Wesley Powell, Civil War hero and explorer of the Grand Canyon, organized the scientific study of the western lands and the native Indians as the powerful director of the U.S. Geological Survey and Bureau of Ethnology and founder of the National Geographic Society. A prodigy, Powell began violin and piano study in Aurora, IL, then studied violin four years with William Lewis in Chicago, to whom she "owed the most." She completed her training with Europe's greatest masters -- Henry Schradieck in Leipzig, Charles Dancla in Paris, and Joseph Joachim in Berlin. Returning to the United States knowing that "girl violinists were looked upon with suspicion," Powell boldly walked into a rehearsal of the all-male New York Philharmonic in Steinway Hall and demanded a hearing from Theodore Thomas, then America's foremost conductor. Deeply impressed, Thomas acknowledged his "musical grandchild" and hired her on the spot to perform the Bruch G minor violin concerto with the New York Philharmonic on November 14, 1885. New York critic Henry E. Krehbiel acclaimed the 18-year-old's debut performance: "She is a marvelously gifted woman, one who in every feature of her playing discloses the instincts and gifts of a born artist." At that time, American appreciation for her art was in its infancy with only five professional orchestras, no established concert circuits, and few professional managers. Solo engagements were difficult to obtain; doubly difficult for a female artist and an American since all orchestra players and conductors were male and generally German. Yet she refused to be lured into a comfortable career in Europe. Her pioneering spirit preferred to face the challenges of the raw, uncultured American continent. From 1885 forward, Theodore Thomas's "musical grandchild" made it her mission to cultivate a higher and more widespread appreciation for her art by bringing the best in classical music to Americans in remote areas as well as the large cultural centers. As one of the most capable and thoroughly artistic violin players of her time, with a nature richly endowed with genius, character, and spirit, Maud Powell was ideally suited to her mission. The young violinist pioneered the violin recital as she blazed new concert circuits throughout the country, even braving the primitive touring conditions in the Far West to reach people who had never heard a concert before. The direct communicative force of Powell's playing, evident in her recordings, stemmed partly from her experience of taking music to people on and off the beaten track. Facing unsophisticated audiences, she began with her uncle John Wesley Powell's premise that "no one can love a symphony who does not first love song." She explained: "I do not play to them as an artist to the public, but as one human being to another." Carefully programming simple melodies with complex sonatas and concertos, she built a bridge of understanding between song and symphony. Never "playing down" to an audience, she performed concertos and sonatas in recital and complex chamber music with the Maud Powell Trio (1908-09) and the Maud Powell Quartet (1894-98). With her innovative recital programming, her own program notes and music journal articles, she steadily elevated her audiences' appreciation for music. Theodore Thomas chose Maud Powell to represent America's achievement in violin performance at the 1893 World's Columbian Exposition in Chicago -- the only woman violin soloist. 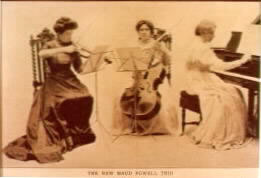 During the 1893 Exposition, Powell presented a paper to the Women's Musical Congress, "Women and the Violin," in which she encouraged young women to take up the violin seriously. At a time when women could not vote and were precluded from playing in professional orchestras, she argued that there was no reason why a woman should not play the violin with the best of the men. Powell herself had proved to the world that a woman could play the violin as well as a man, fulfilling the shared hopes of her mother and woman suffrage leaders Susan B. Anthony and Elizabeth Cady Stanton. As a soloist and one of the first women to lead her own professional string quartet, her example inspired young girls to take up the violin and women to form music clubs and orchestras throughout the land. America's acknowledged "educator of a nation" played special programs for children and advised young musicians aspiring to a career, including the violinist Louis Kaufman and Juilliard violin teacher Christine Dethier. She performed for the benefit of hospitals and schools and for the soldiers during World War I.
Powell became one of America's most revered and beloved musicians while her 1907 recording of Drdla's Souvenir became the most popular violin record of its day. Maud Powell toured Europe, North America and South Africa to wide acclaim, appearing with the great orchestras of her time under such conductors as Mahler, Nikisch, Thomas, Safonov, Damrosch, Seidl, Richter, Wood, Herbert, Stock and Stokowski. She dared to play the most demanding music and to uphold her art before dubious conductors and critics as well as skeptical managers and audiences. Perhaps Powell's greatest artistic triumph was her American premiere (November 30, 1906) of the Sibelius Violin Concerto, which she glowingly described as "a gigantic rugged thing, an epic really....It is on new lines and has a new technique. O, it is wonderful." In his review, New York critic W.J. Henderson asked: "...why did she put all that magnificent art into this sour and crabbed concerto?" Yet in the late twentieth century, the Sibelius Violin Concerto is one of the most recorded of all violin concertos. It was Maud Powell who played it into this honored position in the violin repertoire. Powell introduced fifteen violin concertos to the American public -- by Tchaikovsky, Dvorák, Saint-Saëns, Lalo, Sibelius, Coleridge-Taylor, Arensky, Aulin, Huss, Shelley, Conus, Bruch and Rimsky-Korsakov. She also revived neglected works of the 18th century, including Mozart's Sinfonia Concertante for violin and viola, and even edited a Locatelli violin sonata for publication. The native American boldly championed works by American composers Amy Beach, Marion Bauer, Victor Herbert, Cecil Burleigh, Edwin Grasse, John Alden Carpenter, Henry Holden Huss, Henry Rowe Shelley, Arthur Foote, Charles Wakefield Cadman, Grace White. Composer-pianist Amy Beach dedicated her Romance for Violin and Piano, Op. 23, to Powell which they premiered together at the 1893 Women's Musical Congress. Powell even transcribed music for violin and piano and composed her own cadenza for the Brahms Violin Concerto. Powell's art -- a synthesis of the major European schools transfused with the American spirit - set an enduring standard for virtuosity and musicianship. With an immense repertoire, she was one of the first to play works from Corelli to Sibelius with masterly breadth of style, absolute technical command and deep interpretive insight. With her American premieres of the Tchaikovsky, Dvo Í ák and Sibelius violin concertos, she advanced violin technique into the modern age. Powell's records are a fitting testimony to one whose dedication to the violin, music and humanity inspired generations of Americans to cultivate music on their own. Despite their primitive sound, we can still be thrilled by the dash and style of her playing and moved by the power and conviction with which she conveyed her musical message. This rich recorded legacy confirms why the name of Maud Powell stood alongside those of Caruso, Melba, Kreisler and Paderewski as one of the "Victor Immortals." Ironically, Maud Powell's life of achievement ended the same year that the Nineteenth Amendment granting national suffrage to women was ratified. Upon her death on January 8, 1920, the New York Symphony paid tribute to this "supreme and unforgettable artist": "She was not only America's great master of the violin, but a woman of lofty purpose and noble achievement, whose life and art brought to countless thousands inspiration for the good and the beautiful." 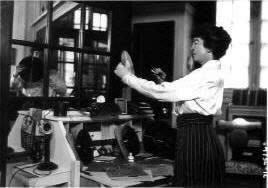 Karen A. Shaffer is Maud Powell's biographer and the founder and president of The Maud Powell Society for Music and Education. For more articles on women in music, read our free online magazine "The Maud Powell Signature."